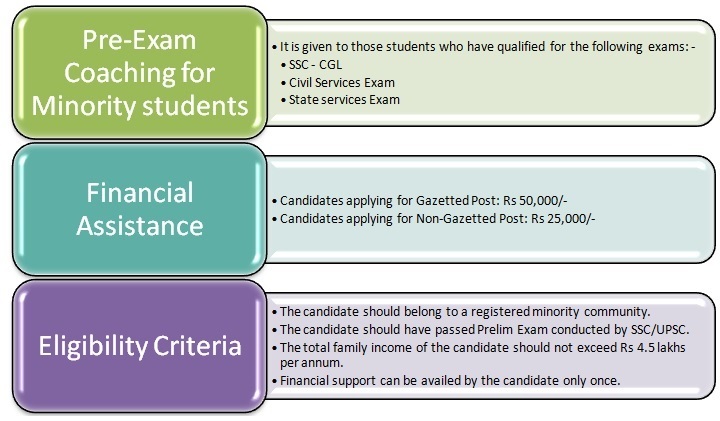 What kind of support provided to Minority Students clearing Prelims conducted by SSC? The minority students who have cleared SSC Prelim Exam are offered special assistance and support to cope with the competition and improve their participation in the central service. The scheme aims to improve the participation of minority communities in the government services like UPSC and SSC. Poor participation and low representation of minority students in the government machinery is an evident fact, known to everyone. According to a report published by National Commission on Religious and Linguistic Minorities, the representation of minority communities in central civil services continued to remain lower compared to their overall population. The general downward trend in this phenomenon has caught the attention of Ministry of Minority Affairs, who has employed certain policy measures to counter this move. The scheme was launched as part of the 11th Five Year Plan and it points out certain measures that aim to improve the participation of minority communities in the government services like UPSC and SSC as well as self-employment and wage employment opportunities. The scheme as detailed a plan to provide free pre-exam coaching to minority students who have cleared the SSC CGL Preliminary examination. The coaching is provided through selected coaching centres to make minority community students more competitive and clear the competitive Civil Services Examinations. For more details, students can visit the official website of Ministry of Minority Affairs. Civil Services and SSC jobs candidates who have cleared prelims exam conducted by Union Public Service Commission, Staff Selection Commission and State Public Service Commissions are also entitled direct financial support from the government. The move is aimed at adequately equip them to compete for appointment to Civil Services in the Union and the State Governments and to increase the representation of the minority in the Civil Services.